Idaho “Wolf Control Board” Passes the House. Today the Idaho House held its final hearing on Governor Otter’s “Wolf Control Board” bill HB470 which establishes a board which would be composed solely of people appointed by the Governor that would oversee wolf control in Idaho. The board would be funded using $2 million in general funds, $110,000 from the livestock industry, and $110,000 from the Idaho Department of Fish and Game. The bill passed the House with a 49-16 vote and will be sent to the Senate. (e) A member of the public at large, not to exclude any person who may have sportsmen or livestock interests. The debate of the bill was lively and, after Representative Gibbs (R) District-32, Grace, introduced the bill to the floor, Ilana Rubel (D) District-18, Boise, took the floor to argue against the bill. Every bit of data that we got from Fish and Game shows that the number of wolves is actually dropping based on those measures, and dropping substantially now already without spending two million dollars. The number of wolves has dropped by 30% and has dropped every single year since 2009 based on the hunting and control measures we have right now. The number of breeding pairs in this state, which is the best predictor of whether there will be more wolves in the future — are they breeding? are there breeding pairs? — that’s dropped by 40% in the last five years. So really the numbers are on a downward trajectory and in light of that data I don’t see any reason to give five times the amount requested when we have 39 school districts that can’t keep the lights on five days a week. This money is going to come out of the other pots. It’s going to come at the expense of roads and schools, teachers and every other priority that we have and I don’t see any rationale for an expenditure of this magnitude at this time in light of the data we’ve been provided. Representative Mat Erpelding (D) District-19, Boise. Forty-three thousand hunters raised $380,000 a year buying hunting tags. … The reality is that sportsmen are already doing their part, $380,000 a year is already doing their part. And to take $2 million, to ask JFAC for $2 million for this, which is what was originally in this bill, seems to me to be fiscally irresponsible. That’s basically two teachers per school district in Idaho that could be paid for, or we can use it to eradicate somewhere between 300 and 400 wolves. Representative Phylis King (D) District-18, Boise. This bill is a reckless use of taxpayers’ money. I think it’s also an ill-conceived and non-scientific way to manage the state’s wolf population. By singling out one species of animal to slaughter and using general funds, we are setting precedent. First, that we are not using scientifically based plan to manage wildlife. Second, we are using general funds in a program in Fish and Game and Fish and Game is not generally an agency that uses general fund dollars. The good lady from 19 mentioned that the population has decreased slightly and that the decreased pairs have decreased slightly. That may be true but the problem is that counting wolves is not an exact science. These are known, absolutely known numbers, not speculative, not the ones that have been seen but not confirmed. Representative Gibbs is correct when he claims that counting wolves is not an exact science but he is incorrect in his assertion that only confirmed wolves are counted. This can be seen when you read through the methodology used to calculate the year end estimate in the 2012 Idaho Department of Fish and Game wolf report. From 1996 until 2005, wolf populations were counted using a total count technique that was quite accurate when wolf numbers were low and most had radiocollars. Since then, we have used an estimation technique that is more applicable to a larger population that is more difficult to monitor. In 2006, we began using an estimation technique that has been peer reviewed by the University of Idaho and northern Rocky Mountain wolf managers. This technique relies on our documented packs, mean or median pack size (mean or median of the sample pool of packs where counts were considered complete), number of wolves documented in small groups not considered packs, and a percentage of the population presumed to be lone wolves. We have modified this technique slightly since first adoption. In recent years we have used a total count of wolves for those packs where we have a high degree of confidence that we observed all pack members and have applied the mean or median pack size to the remaining packs with incomplete counts. We previously used the mean pack size for all packs. We use the statistical mean when number of packs with complete year-end counts is ≥20, otherwise median pack size is applied to the remaining packs. In other words, it is an estimate that depends on getting complete counts of enough packs to make their estimate statistically valuable. In addition, because the methodology is based on research conducted on the Northern Rockies wolf population while the population was increasing and there wasn’t hunting, the estimates may sway either way meaning that they could as easily be higher than the actual number of wolves. The delisting criteria and the state control plan calls for Idaho to maintain ten, ten, ten packs, not a hundred and eighteen, ten packs. This assertion is incorrect. The 2002 Idaho Wolf Management Plan and the 2009 delisting rule requires the state to maintain a minimum of 15 “breeding pairs” not “ten packs”. There is a big difference in definition between these two terms and the definition of breeding pairs is very specific. The 2009 Delisting Rule, which is the rule that the USFWS was required to publish in the Federal Register when Congress delisted wolves in the Northern Rockies outside of Wyoming, contains triggers for a status review. Three scenarios could lead us to initiate a status review and analysis of threats to determine if relisting is warranted including: (1) If the State wolf population falls below the minimum NRM wolf population recovery level of 10 breeding pairs of wolves and 100 wolves in either Montana or Idaho at the end of the year; (2) if the wolf population segment in Montana or Idaho falls below 15 breeding pairs or 150 wolves at the end of the year in either of those States for 3 consecutive years; or (3) if a change in State law or management objectives would significantly increase the threat to the wolf population. All such reviews would be made available for public review and comment, including peer review by select species experts. Additionally, if any of these scenarios occurred during the mandatory 5-year post-delisting monitoring period, the post-delisting monitoring period would be extended 5 additional years from that point. Gibbs also made an assertion that hunting and trapping has not killed greater than 35% of the wolf population in any of the previous years. Biologically, we have been told numerous times in committee that harvest of 35% is necessary just to maintain the population. We have never achieved a sustained harvest of 35%-40% on the grey wolf since we started harvesting them in 2011. This is untrue as well. Based on Idaho Department of Fish and Game numbers the mortality has ranged from from 42-48% when calculated from the beginning of April each year to the end of March. I use these time periods because wolves only have pups once each year in April and the population only declines from this time until they have pups the following year. In this period from 2011-2012 the total documented mortality was 47%, from 2012-2013 42%, and from 2013-2014 – if the mortality trajectory remains the same and is similar to last year – it will be 48%. If you remove all types of control, Idaho Department of Fish and Game, Wildlife Services, and public control — this leaves leaves hunting, trapping, natural, illegal, vehicle, and unknown mortalities — the mortality was 39%, 37%, and 37% respective to the time periods above. I assembled some numbers to address other specific points below. The population has declined by 30% since Idaho took over management of the species in 2009. The end of the year estimates are the measure referred to in the annual reports and at the end of 2009 there were an estimated 856 wolves. Presently the end of year population, based on the preliminary estimate given to the legislature by Idaho Department of Fish and Game biologist Jeff Gould, is “less than 600” and about 75 wolves have been killed since then. The Mortality records obtained through public records requests and published on the Idaho Department of Fish and Game website indicate that the population is likely to fall to around 460 animals by the end of March 2014 just before female wolves begin denning activities. 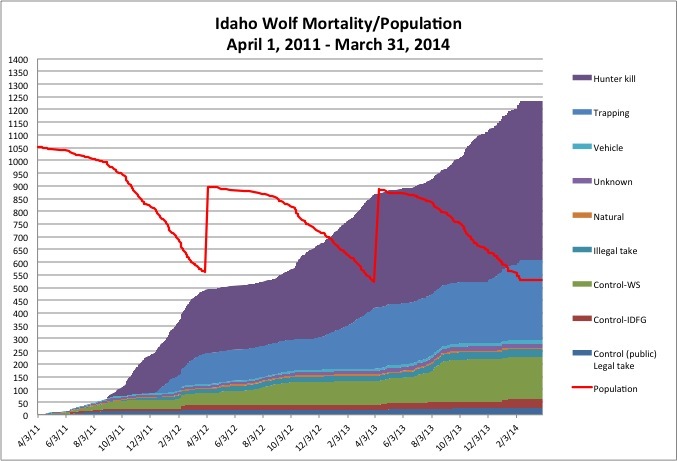 During the period from April 1, 2011 to the present 1,236 wolf mortalities have been documented by the Idaho Department of Fish and Game. 98.5% (n=1,213) of those mortalities were human caused, 1.4%, (n=17) were unknown, and 0.5% (n=6) were natural. 55 Responses to Idaho “Wolf Control Board” Passes the House. And once again Idaho is making wolf policy based on false information. What a wonderful dissection of political nonsense. Thanks for bringing this to light. I don’t live in ID, but i do try to follow the plight of the wolves. Can’t these people just get a life!? Sorry, But Wolf Slaughter Is Not American | Latest News | Earth Island Journal | Earth Island Institute. That means a lot coming from you. Thanks for all of the work you do too. Ken- I was the last one to testify at the wolf meeting last Monday. I had to leave for about ten minutes to feed my parking meter, so maybe I missed your testimony. Did you present this info to the house commitee? This seems like something they should have heard and seen. I just heard a report on NPR that there is a nationwide shortage of Clowns. No talk yet of placing Clowns on the Endangered Species list , but there are great concerns that a valuable creature mat be heading for extinction. I cannot imagine an America without an abundance of Clowns ? Where have they gone? Has anyone thought to look in the Idaho legislature ? Ah-ha! I see fifty Clowns. So using the same statistical multiplier methodology that certain Idaho Legislators employ to determine wolf numbers, there must be at least 150 Clowns hanging around government habitat in Boise, somewhere. That’s too many. We need to thin the Clown population down to acceptable numbers. Hunt and trap and bushwhack till there are only 20 Clowns total. The management plan calls for only 10 breeding age adult Clowns, so idaho game managers are nstructed to do their best to keep the total population at no more than 20 Clowns in government to avoid relisting them. Those 20 clowns must all have red rubber noses with GPS transmitters installed so we can track them and learn about their behavior , and released back into the wilds of exurban Idaho. We must carefully monitor them to see there is no knowledge depredation when they come close to people , structures, and private property. Wild Knowledge Services will have blanket authority to trap and /or eradicate an Clowns seen to be indoctrinating our impressionable youth outside of the Clown Trophy Zone, a/k/a state capitol and a select list of saloons. No more than 10 Clowns in the Idaho state house, OK ? unfortunately, I think the only solution is for non-Clowns to run for office to displace said dominant sub-species. You up for it? Somebody’s gottta sit in that crappy clownsmelling seat and pass legislation along with their gas and time. I know, you’re afraid of getting infected with the infamous ‘Bozo fever’ like many others, but somebody in your state has to risk it. Who’s it gonna be? That was awesome. Well done. Great use if satire/sarcasm to get a point across without calling anyone names. Perhaps only clowns would be insulted. CodyCoyote, please, please write your comment in a letter and snail mail it the Idaho legislature. Every single one of them. If we see 2 of these clowns together in the capital area, can we confidently identify them as a ‘breeding pair’? Including Male-Male pairs, Mark L.
There seems to be an abundance of clowns in Arizona and New Mexico in regards to wolves (and a lot of other things). Here in Kentucky we have no wolves but at least 2 clowns too many. On a more serious note, it was a bad week for wolves in Idaho and Arizona. Hopefully one day those big floppy shoes that clowns wear will come back and kick those clowns in the patoot. Interesting to see that a few legislators are reasonable. Too bad not the majority. I’ve learned this week that the Republican legislators in Idaho are, or at least tell Democrats, that they are terrified of being primaried. Many of them are facing even more right wing opponents. So, I conclude they are so awful because they do not want to fight off a crazy tea party challenge. They will abandon their previous Republican principles for a pragmatically adopted new set. I’m also wondering if the Governor’s latest move triggered the 5 year post delisting monitoring period. I didn’t see an answer. There is no “trigger”. The Endangered Species Act has a 5-year post monitoring requirement for every species and we are in the third year. Sorry to be dense Ken. In the article above is states’ Three scenarios could lead us to initiate a status review and analysis of threats to determine if relisting is warranted including; (3) If a change in the stat law or management objectives would significantly increase the threat to the wolf population. Isn’t killing off most members of most packs fragmenting the functionality of the remainer to the point it becomes a threat to the program? Sorry, I wasn’t clear what you were referring to. That is left to the USFWS and they are under intense political pressure so it it unlikely that they are going to extend the monitoring period. They should but it is not an automatic thing. This is what I have been trying to get a answer on..so thank you. So how can Idaho do this…what am I missing? I do not at all understand. Actually, I think that’s too reasonable an explanation. If you look at the bios of many of the Idaho legislators, you’ll find they are ranchers and farmers, as they do on virtually all the ag-related issues. They are voting in their own interests. They are proudly showing their true colors, demonstrating how ignorant, bloodthirsty, and repulsive they are. at least some are against it, for economic considerations but a few are speaking out against it as they object to the killing. very very bad news for wolves. It’s very clear that Idaho fish and game wants to exterminate wolves from Idaho. Among other colorful metaphors Stewart called out some state legislatures for being ” the Meth Labs of Democracy “. Isn’t there some way to legally stop these people/clowns by pointing out their blatant conflicts of interest while being in a position to legislate their self-serving agenda of exterminating wolves like they were a plague? This means more Court action, not USFWS input which seems to be not forthcoming. There are no laws to use for what you are talking about. There is no accountability for government here. Outrageous. There certainly should be… Thank you Ken. Rubel and King are District 18 reps. Erpelding is the District 19 rep. I fixed that. I should have been paying more attention but I was confused by Gibbs’ mistake when he referred to Rubel as the “good lady from 19”. Have you seen the editorial comment by Tony McDermott published in the SCI-Treasure Valley Chapter newsletter? It is in regards to HB 470 and quite interesting. It was forwarded to me, and I forwarded it to Ralph’s email at cableone.net. I am in favor of hunting and trapping but do not support the “Wolf Control Board”. I am against the wolf control board proposal for several reasons. Primarily the economic impact of directing 2 million dollars to wolf removal. We certainly don’t need to waste money on killing wolves when hunters and trappers are paying for the privilege and have over that last several years done a good job of reducing the overal population. Idaho needs to do as we have stated and transition from reduction of numbers to maintenance of numbers at the 2005 level of 520 wolves. My other reason for opposing this is that it discredits Idaho’s ability to manage wolves. I think the management of wildlife in Idaho should be left in the hands of the IDFG and not be placed in the hands of politicians. The sensationalism being displayed by Gov. Otter and other legislatures directly contradicts the data that has been collected by IDFG. I agree with much of what you have said, although I dislike trapping from personal experience. I appreciate your comment that Idaho needs to slow the “reduction” and go to “maintenance” of the wolf population. If I recall correctly, IDFG was willing to keep a population of around 520 wolves back before the Tester rider, but once it passed, Idaho politicians had the upper hand and no longer felt compromise was necessary. Your second paragraph is well said. Idaho politicians are making themselves look foolish, and if this wasn’t so serious, it would be funny. If they don’t have the facts (from IDFG), then why not make some up or disregard ones that don’t fit the political agenda. This whole issue need not even be in the news anymore. A little moderation could go a long way. Of course, Tony McDermott believes the number of wolves in Idaho is currently around 1000, not the numbers estimated by IDFG. I totally agree. I would like to see that money go into our schools. I know up in the panhandle we could use some help. Some teachers have been laid off etc. etc. etc. 2 million to kill wolves? That is nuts. There are many other ways to reduce wolf numbers without spending 7 figures. 1) Reduce the cost of wolf tags. 2) discounts for multiple tag purcharses. I’ve learned that someone running for Pres. may look/sound good for the environment, but in fact face value means NOTHING. the 60’s “trust no one” comes to mind. A actual past in voting/etc. is demanded. I hope that everyone has posted their objections on the FWS website docket. It is open comment period for dropping the Wolf from the Threatened Species List. A lot of the docket comments thus far seem to be of the “canned” variety. I can imagine none of those will be read. My comments focused on Governor Otter’s intent to exterminate wolves, his obviously biased appointment selections for the Wolf Control Board and his use of 2 million of tax payers money to further his efforts. I have read that Montana was backed off its wolf hunting a bit due to pressure from resident comments. If Montana citizens can make a difference, we can too in Idaho. Once again, the opportunity beckons for wolf advocate dollars going toward wolf management, in exchange for a voice at the table. In my honest opinion, This controversy will never end until the above opportunity is utilized. The mandated membership of the Board says it all and ensures that wolves will never get a fair chance in this state. Could be the governor’s most cynical stroke yet! Some good news. The ‘wolf board’ isn’t going to get the 2 million requested. A little bit of wolf karma at work. Yay!!!! Woo-hoo!!!!!!! Good sense prevails. This is no comfort to me. They are still getting funds to kill wolves. They will just pay themselves less to get their agenda done. No? At least the rest of the state’s residents dont want it, and can see their taxpayer money can be better spent, so that is a good thing. Let them call on their deep-pocketed friends in high (and low) places rather than the taxpayers. Gov. Otter has been friendly with Las Vegas casino types. That might be a good idea, perhaps it’s time for the Guv to call in a favor from the politicians and ranchers, (hellooooooo Jeff Siddoway) or the Simplots to lend him a couple million.